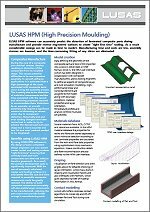 LUSAS High Precision Moulding software is used wherever design engineers want to extract master model and tooling surfaces for composites components "right first time"in order to ensure correctly sized post-cure components are obtained without iterative guesswork. LUSAS HPM has been used on a number of interesting projects. Owing to the nature of the work no further information on these projects can be provided on this page at the moment.